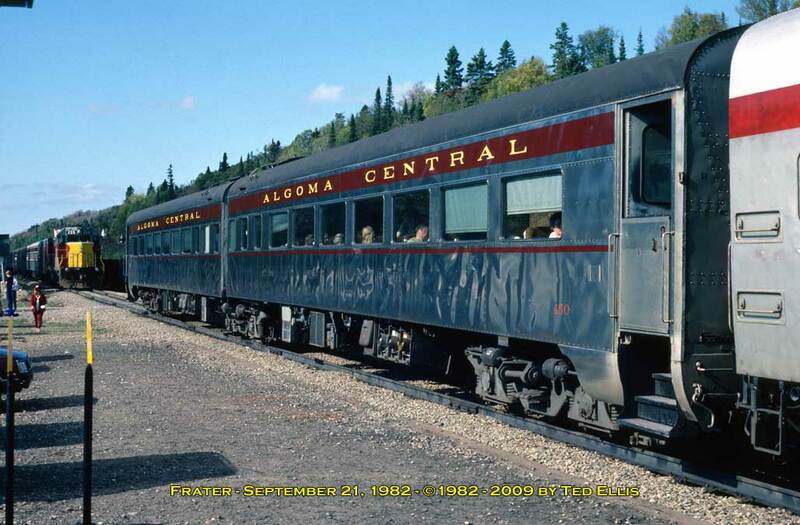 These cars were built in 1951 by the ACR's own shops using the steel underframe of old 40' wooden boxcars. Passenger cars were heated using steam, and no ACR diesels came with steam generators, so heat had to be provided by these cars. Notice in the first photo, 74 rides on Andrews leaf-spring trucks, but in the second photo, it rides on common Bettendorf trucks. Originally these cars would have been painted in the dark green and black scheme. Cars 71 and 73 were scrapped in the early 1970s. Due to the custom built nature of these cars, the body would need to be scratchbuilt. 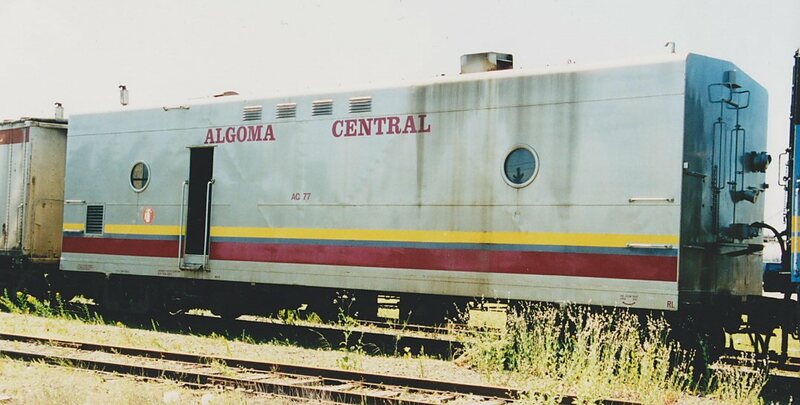 Note that in the earlier maroon colour scheme, the Algoma Central name lettering is located lower down beside the entry door, and the spacing is compressed to fit. On the silver version, the lettering is moved up above the doors to allow it to use the same width and spacing as on most other cars. 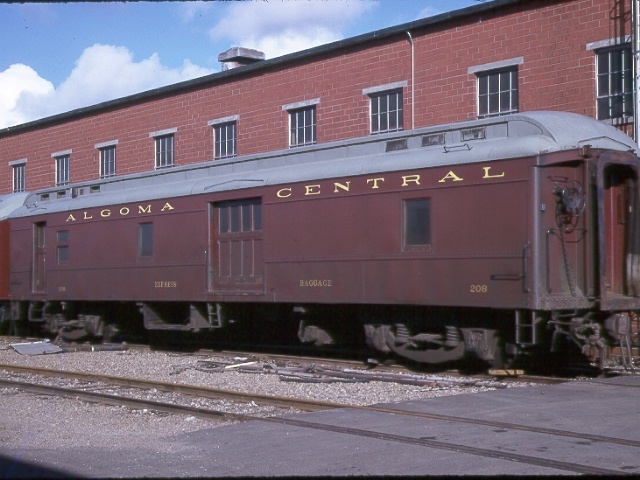 Black Cat Decals offers a set of Algoma Central passenger car decals; this set includes both the standard (wide spaced) name lettering and the compressed spacing version found on these four generator cars. 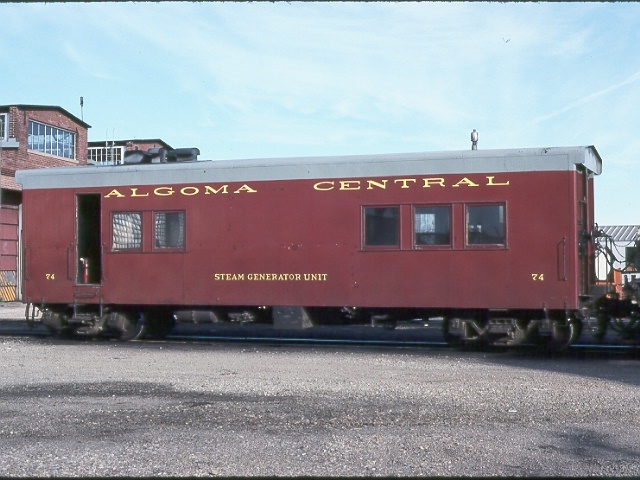 This car 76 was rebuilt from ACR baggage car 204 in 1951 to provide steam for heating the ACR's coaches. The original Allied express trucks were replaced with smoother riding leaf-sprung Andrews trucks. Note that in the 1995 photo in the silver scheme, this car has Bettendorf trucks. This car can be built in HO using Walther's Troop Sleeper as a starting point, or Micro-Trains' Troop Sleeper in N scale. The two windows on either side of the entrance door on the model with have to be filled in and a new opening for the baggage door cut around the original entrance door in the side of the car. Roof vents, stacks and piping will need to be added to detail it as a steam generator. Some of the side windows are also plated over. 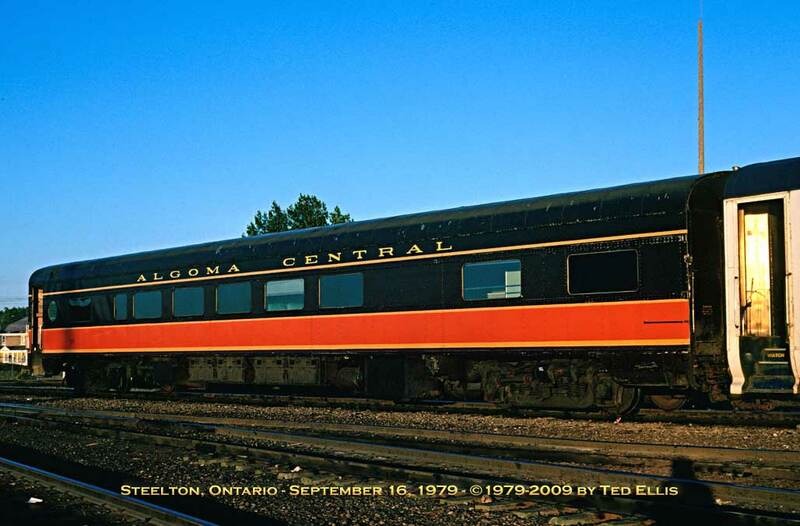 Algoma Central passenger car decals are available from Black Cat Decals. 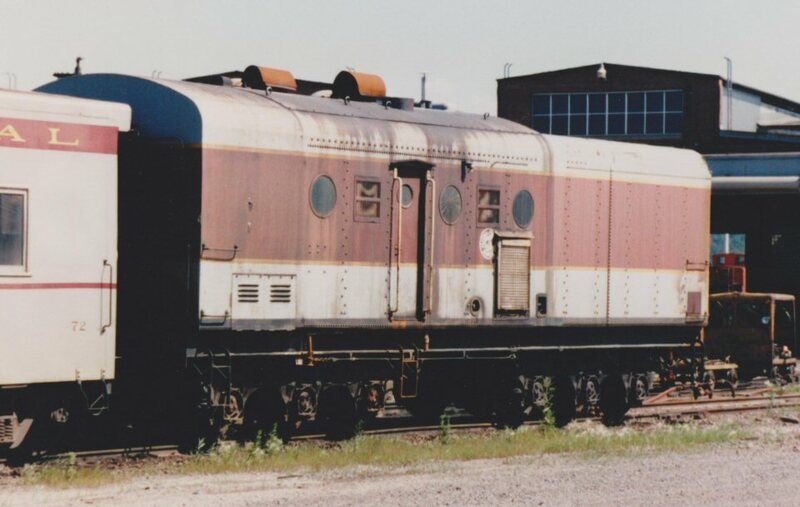 These two cars, acquired from VIA Rail in 1992, are General Motors Diesel-built steam generator cars. A ready-to-run model of this type of GMDD steam generator car is produced by Rapido Trains . Rapido offers it in road numbers 72, 74, 75 and 77, but only 75 and 77 are accurate numbers for this model. Model Photo. 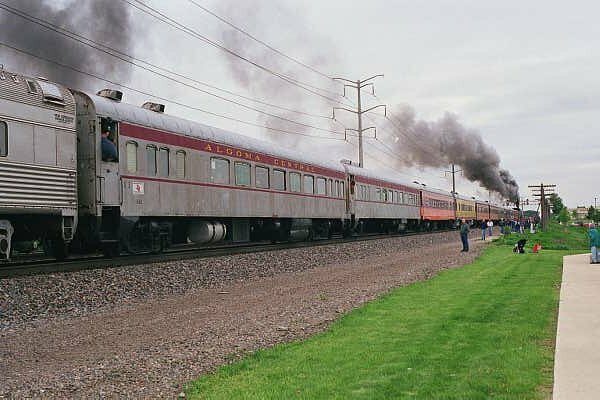 These interesting cars were rebuilt from Northern Pacific auxiliary tenders that were pulled behind large locomotives to provide more fuel and water. 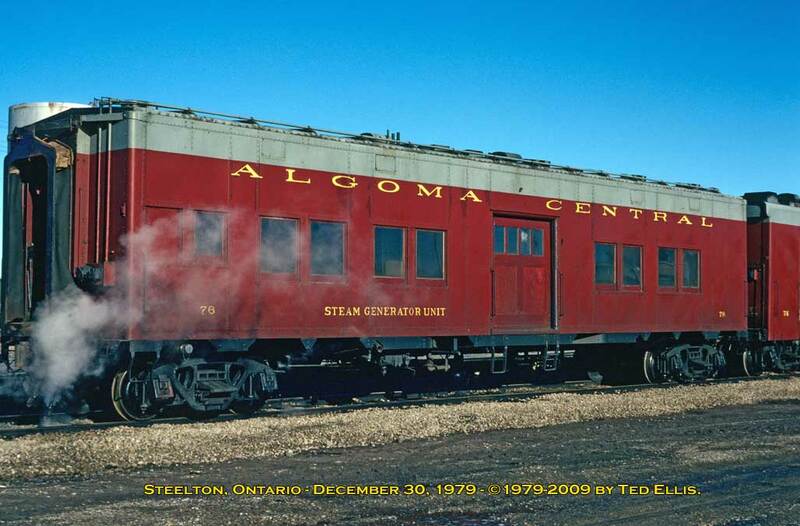 With the demise of steam, NP had them rebuilt as steam generator cars, and in 1972 the Algoma Central took possesion of two of these cars. 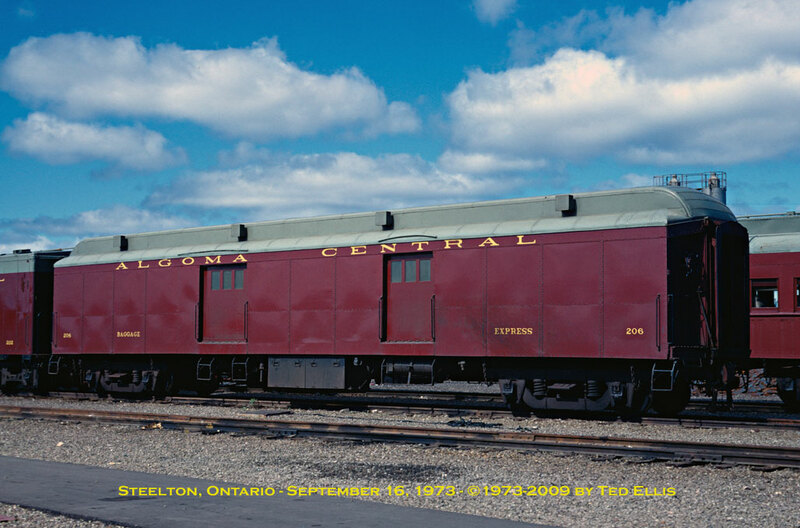 They were painted in 1973 to match the Algoma Central's locomotives. Retired and scrapped around 1996-97. Acquired in 2007 to provide electrical head-end-power for several new cars (HEP equipped baggage 312 and coaches	5654-5656) acquired for the regular Hearst train. This car was originally DRGW PB-1 locomotive #600B. It was renumbered 6002 and later rebuilt into a steam	generator car and numbered DRGW 253. 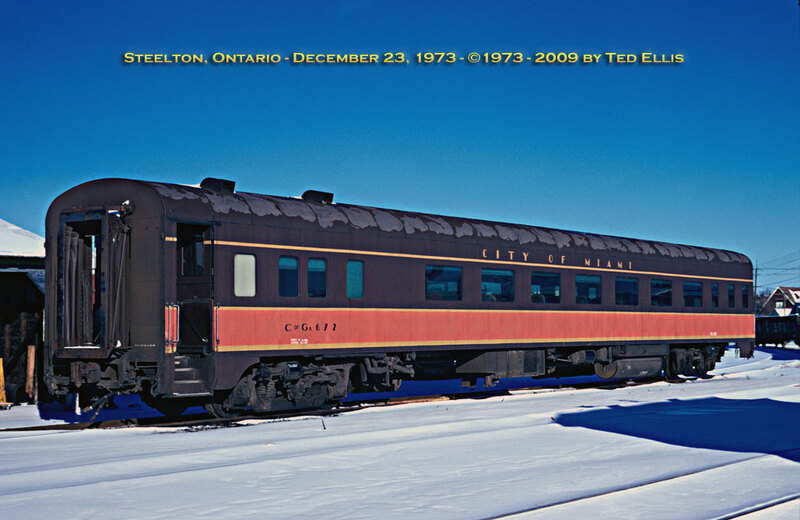 Later it was rebuilt into an electrical power car, keeping it's old	number and eventually sold to Ski Train, from where it was acquired by CN for service on the Algoma Central. Acquired in late 2007 or 2008, the exact history of this car is unknown, but it appears to have been rebuilt from an former Amtrak 1400 series mail/express boxcar. 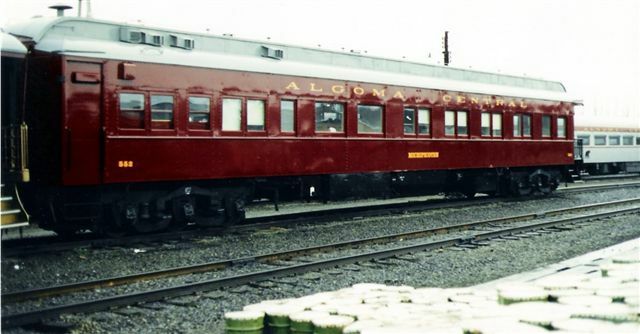 These interesting cars were converted from troop sleeper cars built by Pullman for the US Army in the second World War for transporting troops across the country to ports and naval bases for embarcation to Europe or East Asia. 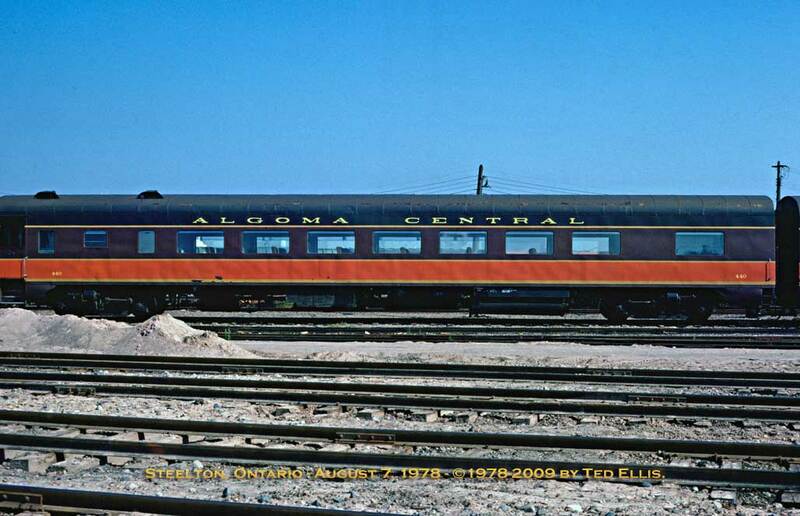 In 1949 the Algoma Central bought five of the surplus cars and had them converted into baggage/express cars. They were rather rough riding on account of their original Allied trucks, and were used for transporting boats, propane tanks, hunter's trophies, etc. In 1951, one car, no. 204, was rebuilt as steam heating car 76, since the ACR's diesels did not provide their own steam for passenger car heating. In 1981, the remaining four cars were renumbered 303-306, to clear the 200 number series for the new GP38-2 locomotives that were arriving. These cars can be modelled in HO using Walthers' Troop Sleeper. Micro-Trains has a Troop Sleeper in N scale. The two windows on either side of the entrance door on the model with have to be filled in and a new opening for the baggage door cut around the original	entrance door in the side of the car. 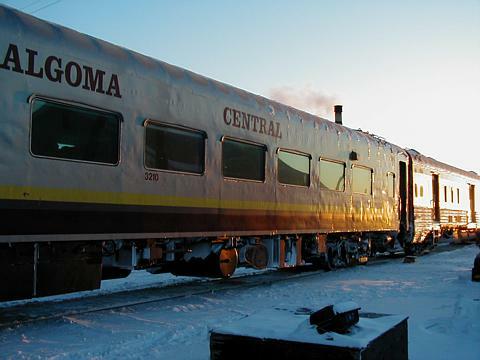 Algoma Central passenger car decals are available from Black Cat Decals. These cars were standard heavyweight baggage cars, acquired secondhand in 1949. They lasted in service into the mid-1970s when they were retired into work service. Express baggage car 208 was a 60-foot heavyweight baggage car from the Denver and Salt Lake Railroad. This car was acquired around 1949 and lasted in service to the mid-1970's when it was retired to work service as tool car 10059. These two cars were purchased in 1973 from the Denver & Rio Grande Western RR, which had acquired the cars from the Chesapeake & Ohio railroad. In 1981, the two cars were renumbered 300-301. Nickel Plate Car Co. (etched plated brass) and Union Station Products (laser cut styrene) both offer car sides for these DRG&W cars that can be mated with Train Station Products Pullman-Standard car core kits to build a model of this type of baggage car. 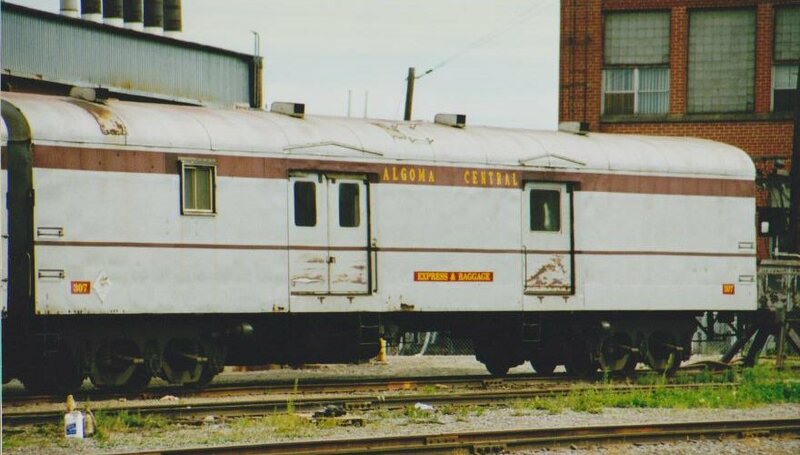 Algoma Central passenger car decals are available from Black Cat Decals, and this set includes the variant narrow lettering found on this pair of cars. An accurate model for this car can be obtained in HO scale from Broadway Limited Imports' series of California Zephyr cars. 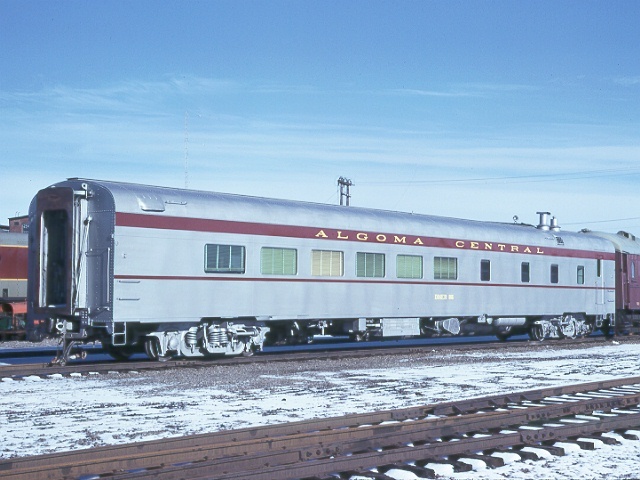 Algoma Central passenger car decals are available from Black Cat Decals, and this set includes the variant narrow lettering found on this car and several other AC baggage cars. Model Photo by Chris vanderHeide of BLI baggage car custom lettered with Black Cat Decals. Renumbered in 1981 from AC 209-210. (See above) Still in service. Renumbered in 1981 from AC 211. (See above) Still in service. Renumbered in 1981 from AC 201-203 and 205. (See above) All cars now off roster. 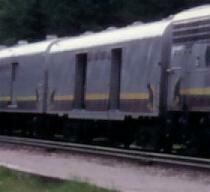 These three cars were acquired from VIA Rail in 1983 and were formerly VIA 9674, 9600 and 9603 respectively. They were originally built for CN as 9674, 9600 and 9603. 310 was acquired in late 1999. Exact history is unknown, but this car is likely ex-Fox River Valley and Western. Another CN lineage baggage car, this car was acquired in 2001 from CN, where it was in work service. Formerly CN 71303, ex-VIA 9628, ex-CN 9628, originally CN 9247. Acquired in 2007 from Amtrak (ex-AMTK 1173, ex-ATSF 3460) along with coaches 5654-5656 for use on the Hearst	passenger train. This car and the three coaches are equipped for head-end electrical power from generator cars 78 or 79. 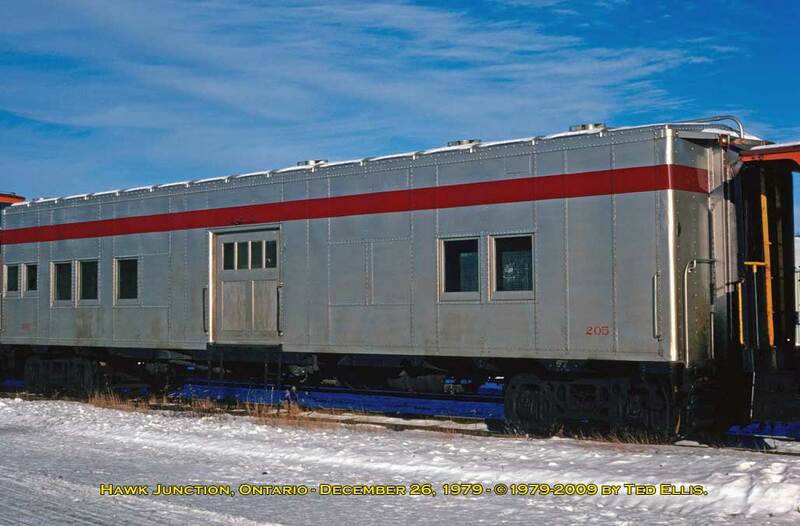 Purchased in 1949 from the Denver & Rio Grande Western Ry., these were the ACR's first steel	coaches and lasted in service until the mid-1970s when the new Canadian Pacific coaches were obtained and put in service. Interestingly enough, built in 1912, these cars were actually two years older than the wooden coaches they replaced. 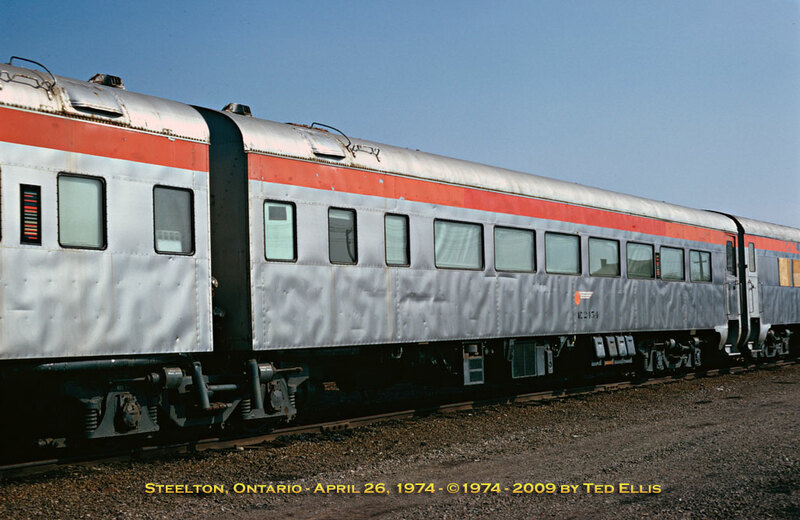 These cars were acquired from 1969-1974 from Canadian Pacific. Click here for photos and detailed information about these	coaches. 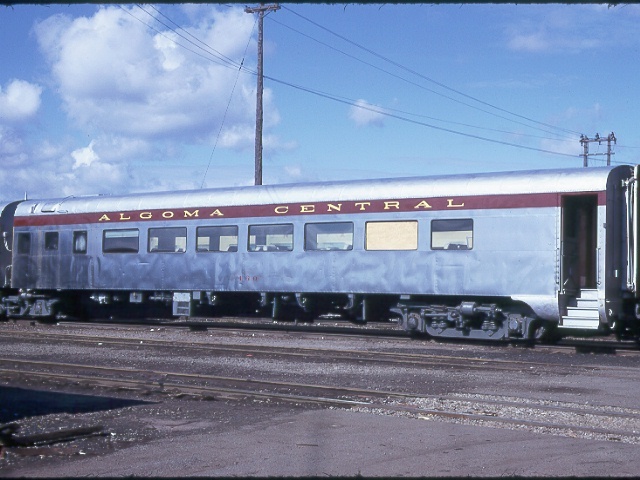 These coaches were purchased in 1974 from the Central of Georgia railroad. They arrived in Illinois Central colours, and the condition of the paint was so good that the cars were not fully repainted for almost 5 years. 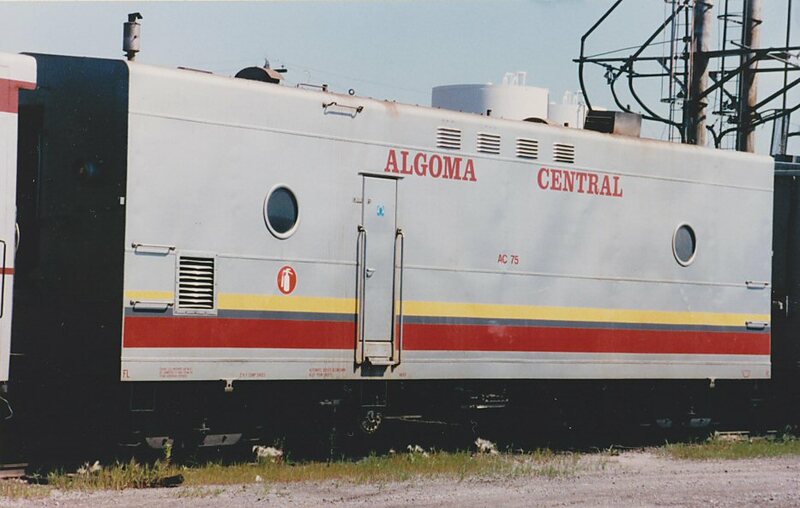 Only the Algoma Central name and numbers were repainted. AC 440 ended up at the Southern Appalachian Railway Museum, while ex-AC 442 and 443 are currently in service with the trainset for steam engine MILW 621 as NSR 201 and 202. 441 was renumbered to 2067 in the late 1980s or early 1990s and may have been scrapped. 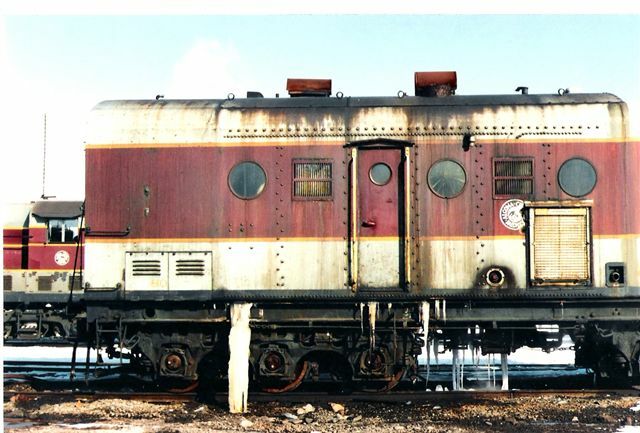 Two cars, GM&O 3056 and 3057, were acquired by the ACR in 1974. Some rosters actually gives these cars the AC numbers 444 and 445, but I have no evidence so far that these cars were actually refurbished and put into passenger service. They seem to have been parted out and then put into work service. They did later get rebuilt into crew sleepers 10633 and 10674. Information is slightly sketchy on these, with some sources listing 5 sets of ex-SP articulated being acquired by the AC, and variously indicating that only either 2 or 3 sets were ever reconditioned and put into passenger service; however there are references to positively identify at least six sets as being sold to the AC with at least 3 proven to be fully repainted and used in regular service. The total identified number range seems to allow for at least 7 pairs, for a total of 14 individual car bodies. (Compared to 18 ex-CP lightweight coaches) However since only some of these cars seem to have actually been put into passenger service, with the remainder possibly being directly placed into work service as sleepers, diners, etc., it's rare to actually see more than one pair in service on a train. Some may have run for a time with their SP numbers and paint, and several sets ended up in work service, still with SP lettering evident. It's not certain if all of pairs identified below actually received their indicated AC numbers or any sort of AC paint job. Certainly 450-451, 458-459 and 460-461 can be conclusively identfied as being painted in full AC colours. Some variations in the paint and lettering occurred on these cars; some had silver roofs, while others had black roofs (some had the roofs repainted black over time), and initially the cars were repainted without the belt rail stripe. Some cars as evidenced by Ted's photos of 450-451 received a "quicky" repaint early on, just adding the bear image and car numbers with the name band added on much later. It's also not clear if some of these cars ran for a while in their original SP colours. 462-463     ex-SP 2477-2478     retired to work service 10014-10015, scrap 1996? Cars marked with an asterisk are definately confirmed to have been fully repainted and used in passenger service. These coaches were purchased from VIA in 1992 and differ from the coaches below in that they have a small on-board snack bar. Externally they are identical, as they were rebuilt from VIA 5400-5600 cars. There are seven coaches in this series, numbered 3210, 3226, 3227, 3230, 3236, 3239, 3243. They retain their previous VIA numbers. 3226 was wrecked in a grade crossing incident with a logging truck near Hawk Junction. These cars were converted by CN from former 5400-5600 series cars and Rapido Trains' new lightweight coach is based on the CN 5400-5600 series and as such is an exact match for the AC cars. There are 19 of these coaches. 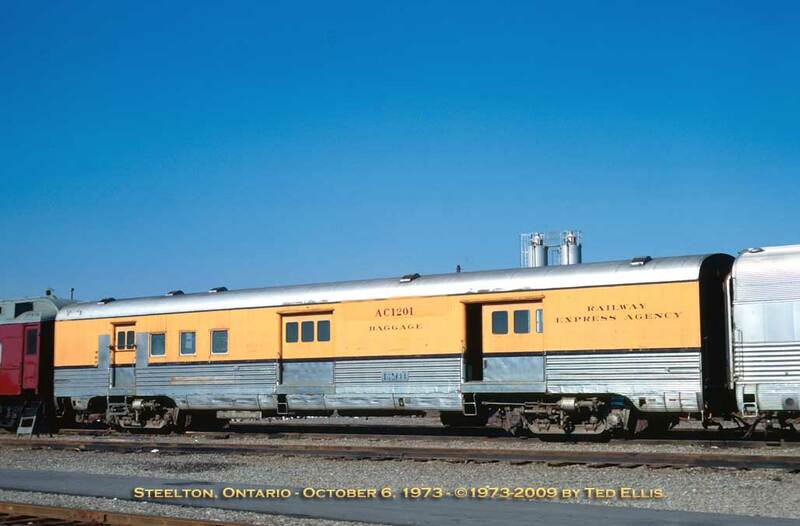 They were built in 1954 for CN, and transferred to VIA Rail in 1978. 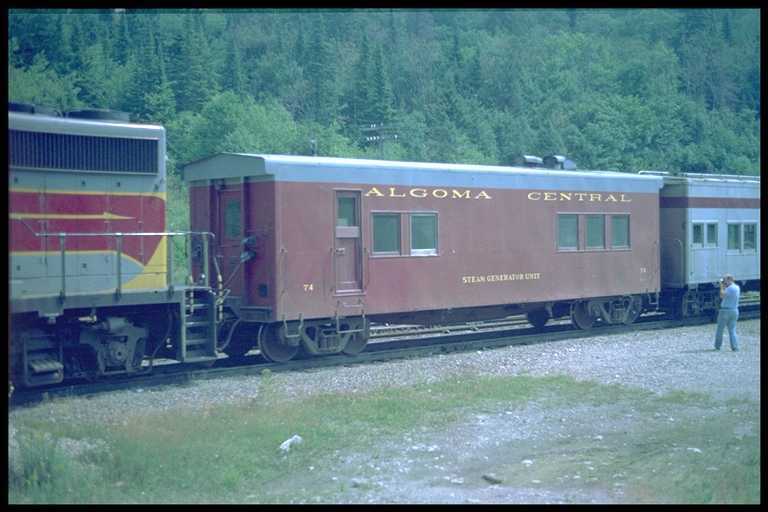 In 1992 they were aquired by the Algoma Central. Some of these coaches are leased from the Ontario Northland Railroad. These coaches still have their former VIA numbers and thus do not form a contiguous series. Rapido Trains' new lightweight coach is based on the CN 5400-5600 series and as such is an exact match for the AC modern fleet. Acquired in 2009 from Ski Train in Colorado, to replaced the 5400-5600 series ex-VIA cars. These cars are ex-VIA/CN "Tempo" lightweight cars built by Hawker-Siddely, which had been sold	to Ski-Train. 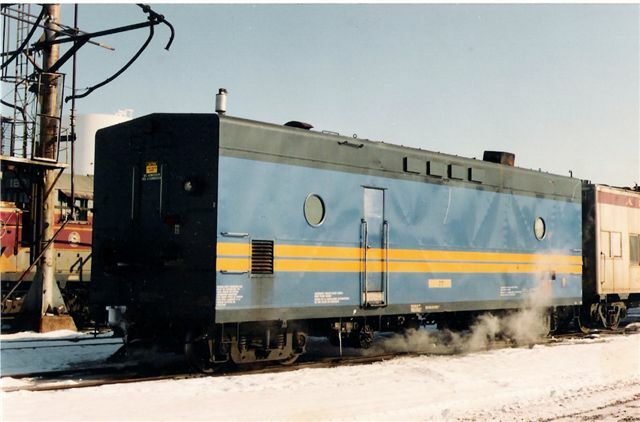 CN acquired the entire set of Ski-Train equipment including 3 F40PH locomotives. This equipment is now in use on the Agawa Canyon Tour Train. Each car is named after local rivers and lakes. These two coaches were rebuilt from ex-VIA combination coach/baggage cars 9301 and 9302 acquired in 1992, which were themselves originally rebuilt from CN 5400-5600 series coaches. 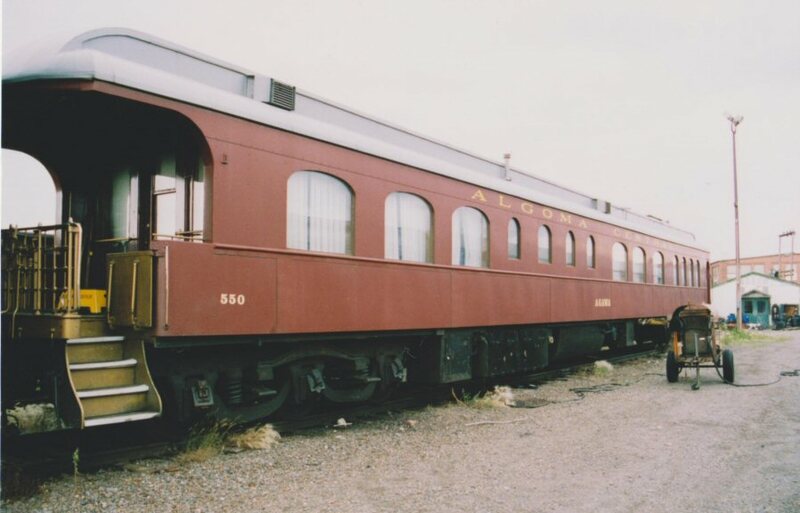 For many years these old converted ex-Rio Grande (original Denver & Salt Lake) coaches served as dining cars on the railway. 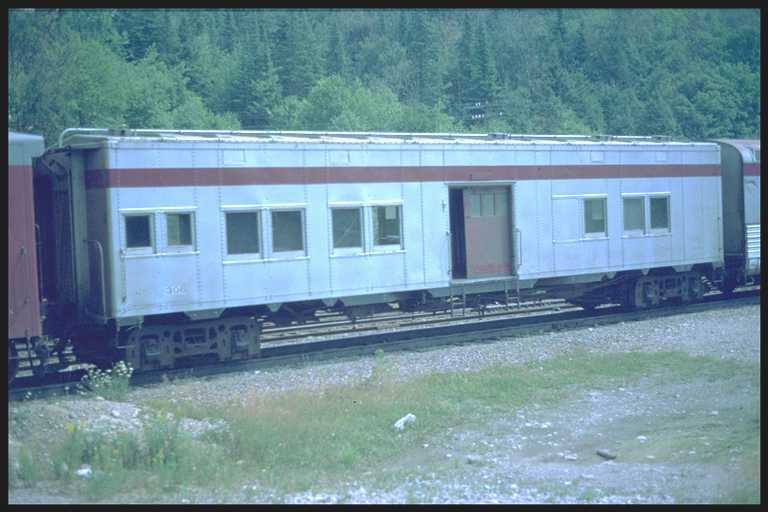 They were obtained in 1949 and lasted in service inot the early 1970's when the ACR purchased two regular diners for the Agawa Canyon Tour Train. These three cars were then retired to work service. The former 502 was later moved to Canyon and converted to a souvenir shop. 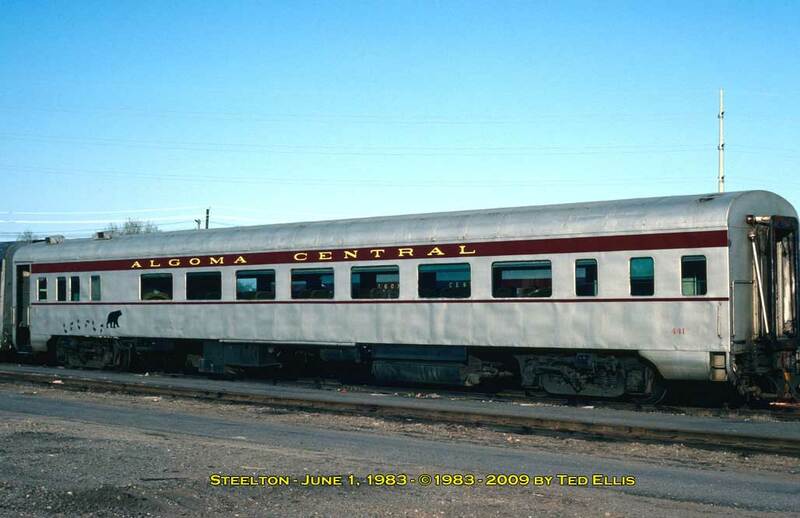 Dining car 504 was built in 1948 for the Atchison, Topeka and Santa Fe as "lunch counter diner" no. 1554. In 1969 it was sold to the tourist railroad Cadillac and Lake City, where it was named Emerald Lake. 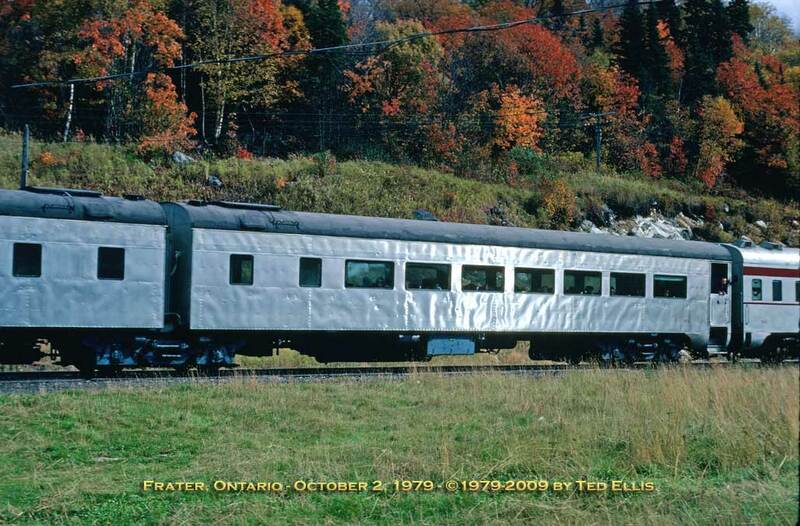 The ACR purchased the car in 1972 for use on the Agawa Canyon Tour train. In 1998 this car suffered a kitchen fire and was put out of service to be replaced by 506. 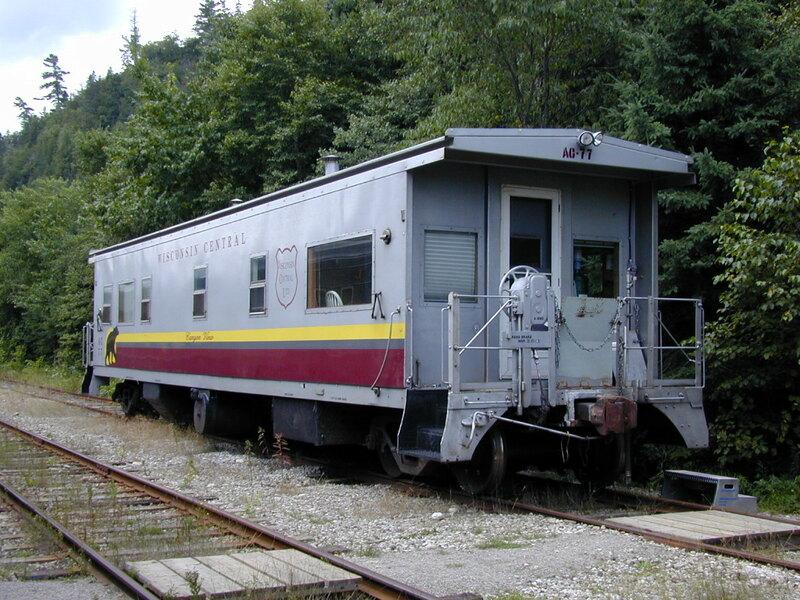 504 remained stored on the property for a few years before being sold to Mid-America Railcar Leasing (MRLX). Originally Union Pacific no. 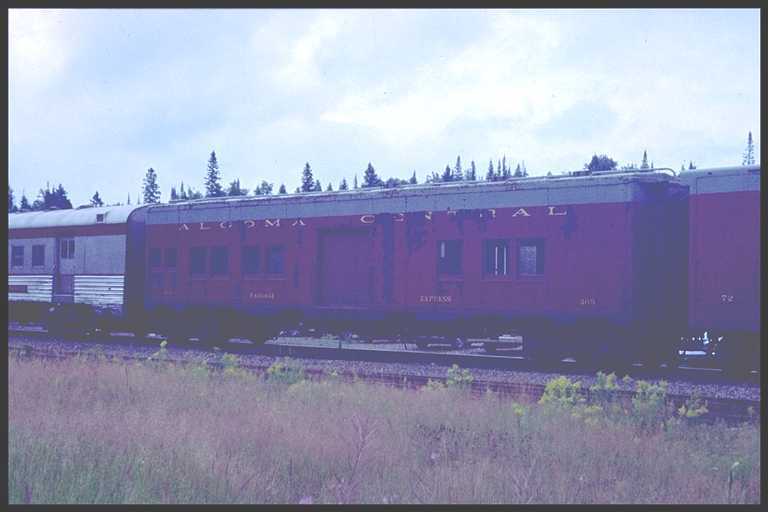 4805, it was purchased in 1973 by the Algoma Central for use on the Agawa Canyon Tour Train, which was gaining in popularity. Walthers offers a model of the UP 4800 series 48-seat dining car which can be used to model this car. Additionally, the old Rivarossi diner was also based on this car. 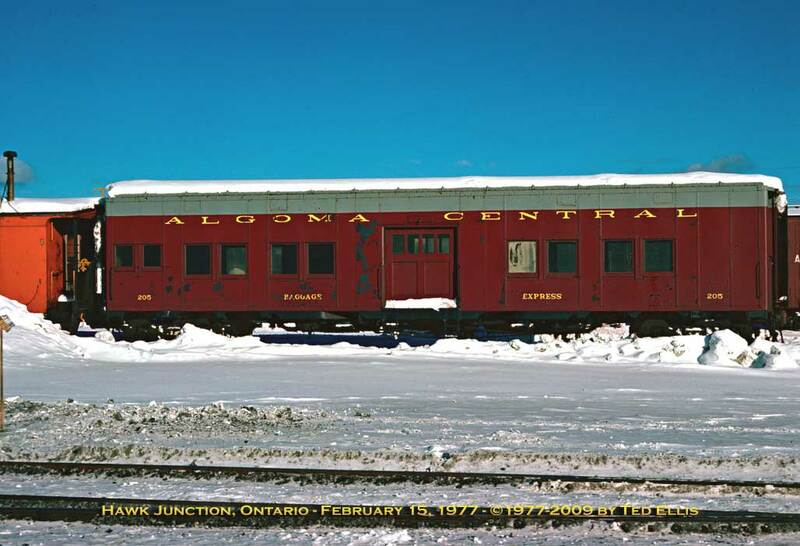 Decals for the circa 1974 Algoma Central silver scheme are available from Black Cat Decals. ACR 506 was aquired in 1998 after Diner 504 was damaged by a kitchen fire. It is the ex-CB&Q 190, Silver Pheasant. 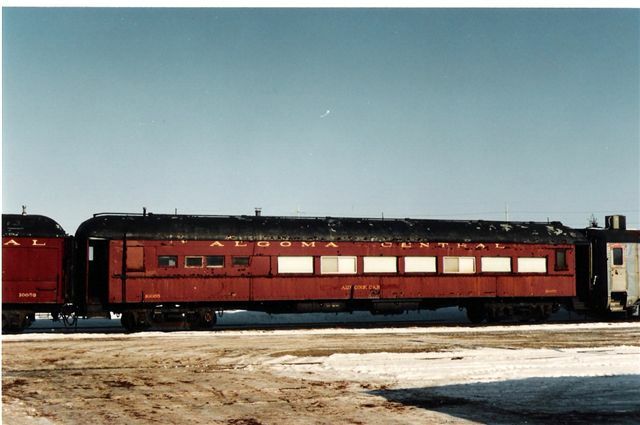 This car was built as Missouri Pacific 870, renumbered 564, then sold to Illinois Central where it became IC 3341. 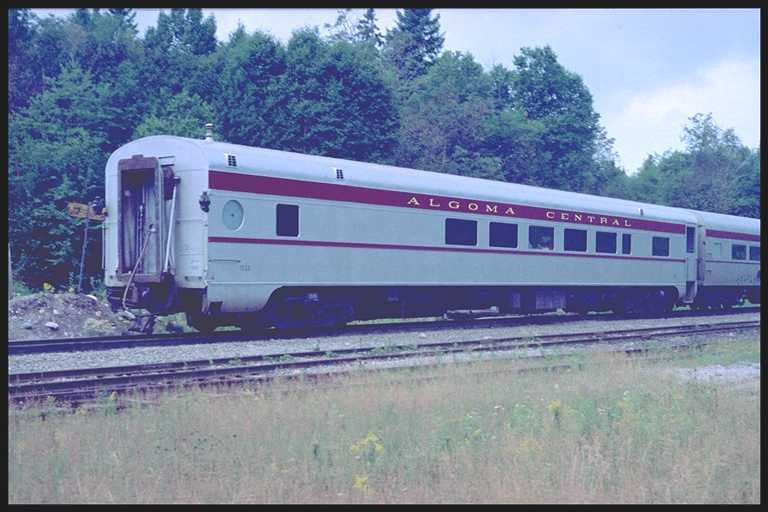 The Algoma Central purchased this car from Illinois Central in 1971. It remained in IC colours until 1982, a full decade after it was acquired. This car was normally used on the regular passenger train. Originally Union Pacific 9001, it was subsequently owned by Auto Train and then Wisconsin Central, with the name Trempeauleau River. 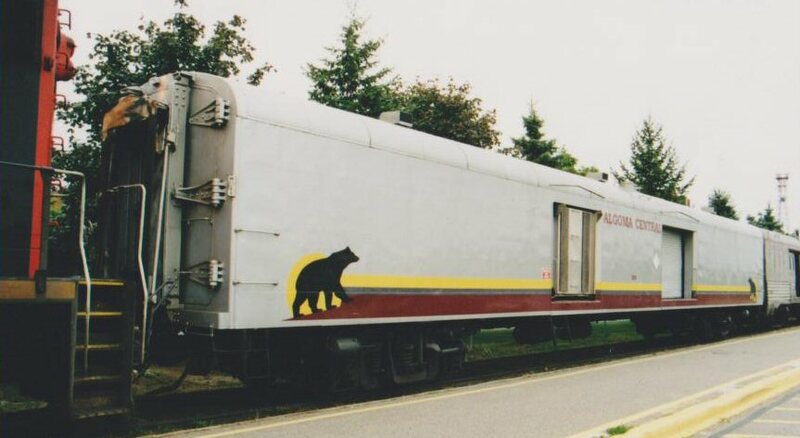 In 1997 WC had the car repainted and transfered to the Algoma Central for the Agawa Canyon Tour Train. The car carries the number GBW 901. 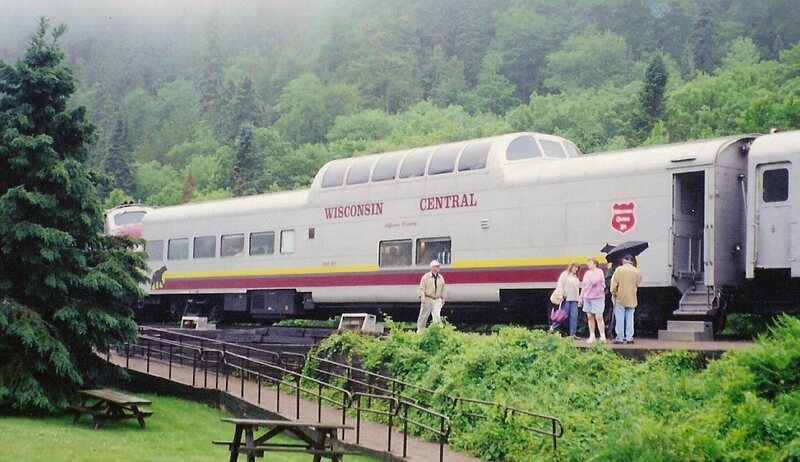 Note that in the 2000 photo	above, the car actually carries the Wisconsin Central name, but by 2004 it has been changed to Algoma Central and the WC shield logos have been painted over. Walthers offers a model of the UP dome coach, and decals for the modern bear scheme were once available from ORO Decals. ORO is long out of business, but the artwork has recently been purchased by Highball Graphics , and so these may become available again. 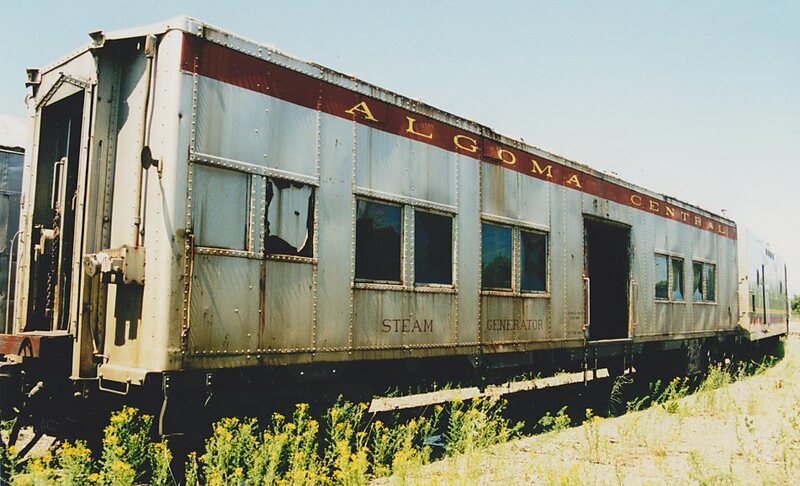 Here's an good article about modeling Algoma Country from the Walthers car by Andrew Castle. Dome Car "Spirit of Superior"
Acquired by the AC in 1999, this car is ex-WP 813 Silver Palace (from the California Zephyr pool) built by the Budd Car Co. In fact, the letter boards still read California Zephyr. The window band is painted dark red with yellow trim, and the name board below the windows is bright yellow. Broadway Limited has produced a set of California Zephyr equipment in HO scale, so this dome car is available from them. (The cars are avaialable individually). There is a passing reference to Car 9 on a page of the 1936 employee's timetable, in a table of weights of various equipment. 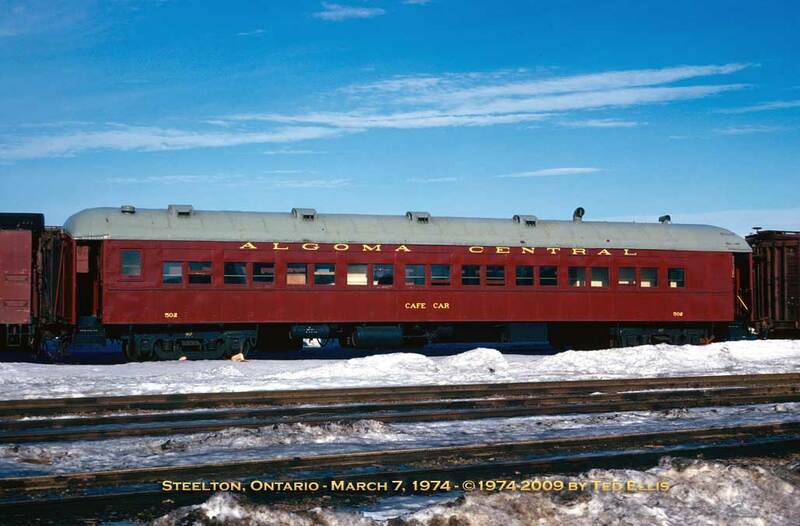 This page is reproduced on page 143 of the book "Algoma Central Railway" by Dale Wilson. I have not yet come across any other references to this car. Car 10 was a wooden business car that for many years was the main business car in use on the railway. There is a large picture window at the rear of the car in the lounge section facing out on the rear platform, with the door on the left side (looking out from the lounge). #10 appears to have probably been formerly named "Michipicoten" and acquired from the Illinois Central around 1900. Renumbering to #10 and elimination of the car's name may have happened around 1910 when the Lake Superior was acquired. 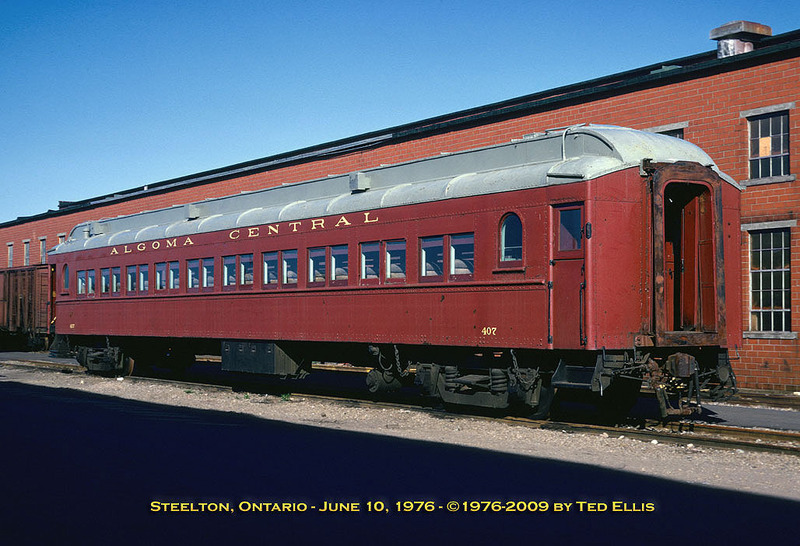 #10 featured open platforms typical of late 1800s built coach stock. #10 was scrapped in the early 1960s. 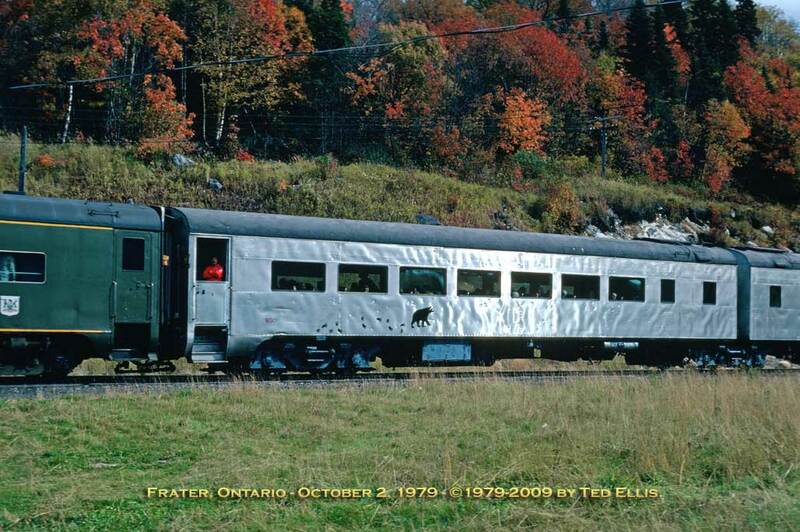 Lake Superior was also a wooden private car and it had a picture window at the rear, very similar to Car 10, but the door onto the platform is on the other side of the car. Lake Superior featured closed vestibules at the opposite end of the car and is obviously of more modern construction than #10, which had open platforms. The origins of this car are unknown but it was acquired in 1910, possibly secondhand. Lake Superior was	scrapped in the early 1960s. The Agawa was built in 1911 by the Barney & Smith Car Company for the Longview, Portland and Northern Railroad as # 101. It was later purchased by the Wabash where it was named the Chicago. 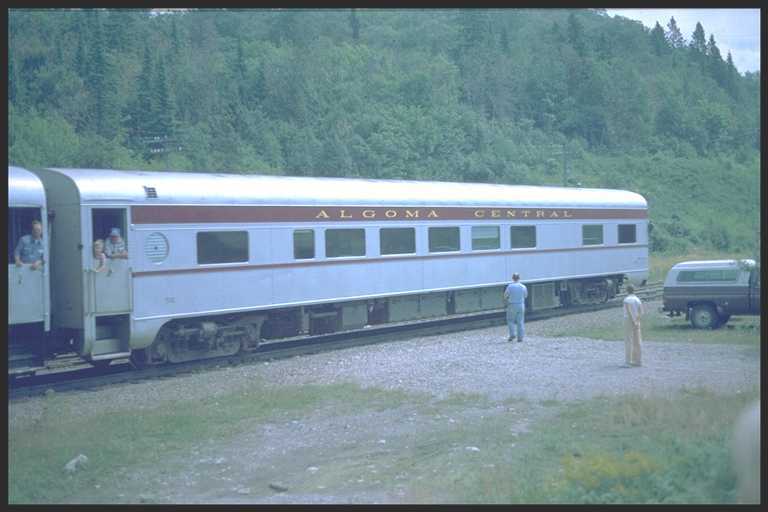 In 1953 it was acquired by the Algoma Central and named Agawa In the late 1960's, it was rebuilt and completely restored by the ACR. The car features a large observation platform at the rear with polished brass railings and a round panel with the ACR logo hung on the rear. Canyon View was one of 5 "double bedroom lounge observation cars" built for the New York Central in	1949. The Canadian Pacific bought three of these cars from the NYC, mainly for overnight Ottawa to Toronto runs. NYC Shining Brook became CP Mountain View. 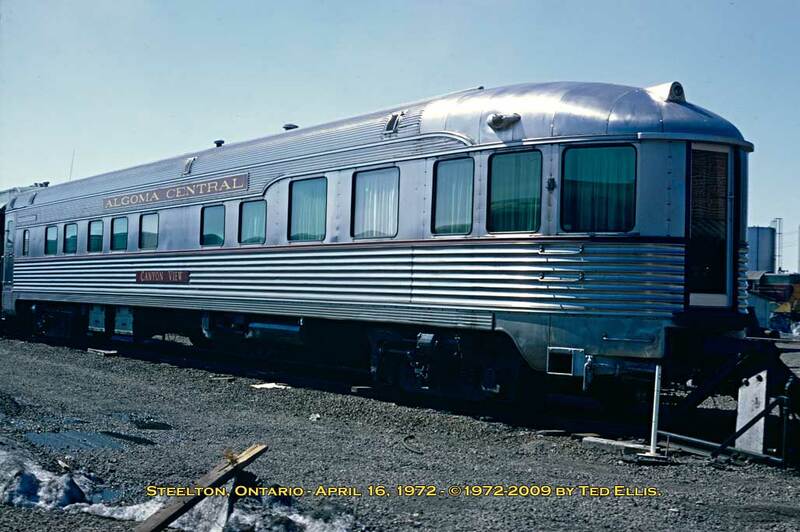 In 1969 the ACR bought the car and renamed it Canyon View (although it was sometimes referred to by some shop employees as the Silver Bullet) The lounge at the rear was raised over a water tank, thus the extra tall windows in the observation end of the car. The rear door was at some point replaced by a sheet of plexiglass for better visibility. A curtain was then added when it was felt that privacy had become an issue. The car was eventually sold around 1984-5. 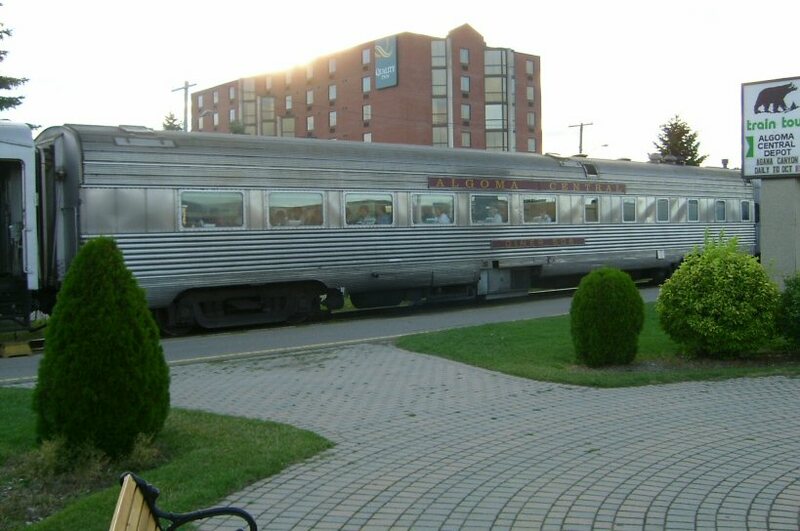 The Michipicoten was built in 1910 by Pullman for the Southern Railway as the Advance. In 1937 it was renamed Asheville, and in 1944 it was acquired by the Algoma Central. In the late 1990's the name Canyon View was revived for the ACR's new "camp car." 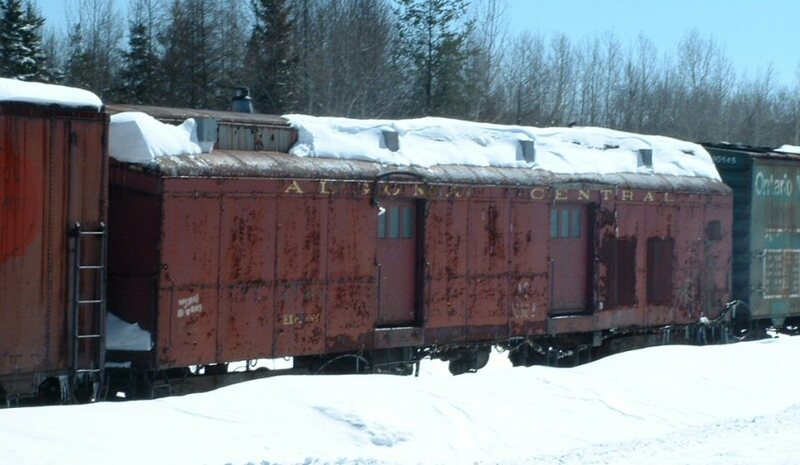 This car is	ex-Green Bay Western business car 1776, which was built from an old GBW caboose. The car features a complete dining room, kitchen, bathroom with shower, and diesel generator. It is available for charter, and is dropped on the siding at Canyon for a weekend and you can camp in the park in the comfort of this fully equipped caboose. 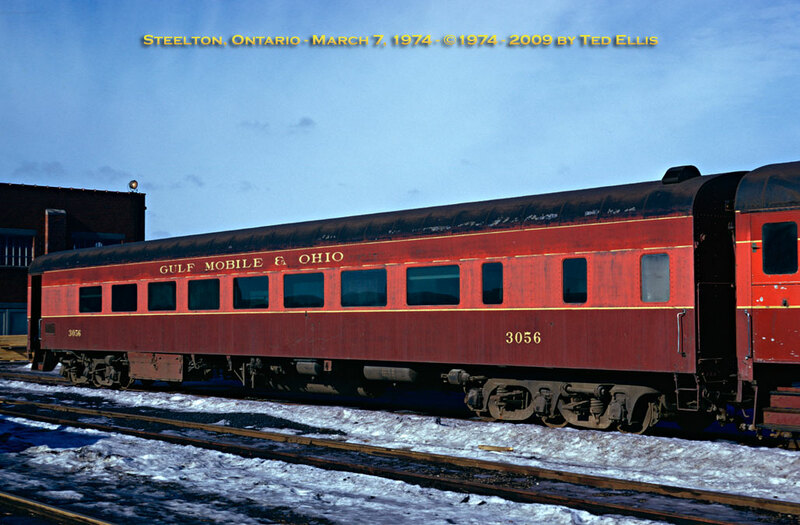 This was the second car to carry the name Canyon View, and also reproduces a number from one of the GMDD-built steam generator cars. 1913? (Green Scheme) - Not much is known about the ACR's early passenger equipment up unitl this point. However the new cars delivered in 1913 were painted a handsome dark forest green colour, with black roofs and yellow-gold lettering. It's likely that the earlier 1900 equipment may have also been in this colour scheme. This scheme rapidly weathered into sort of overall dark colour. The steel cars acquired in 1949 were also painted this green colour. 1952-3? (Maroon Scheme) - In 1952 following the introduction of diesel power on the ACR, the passenger paint scheme was also upgraded, this time with maroon sides and a grey roof with yellow lettering. 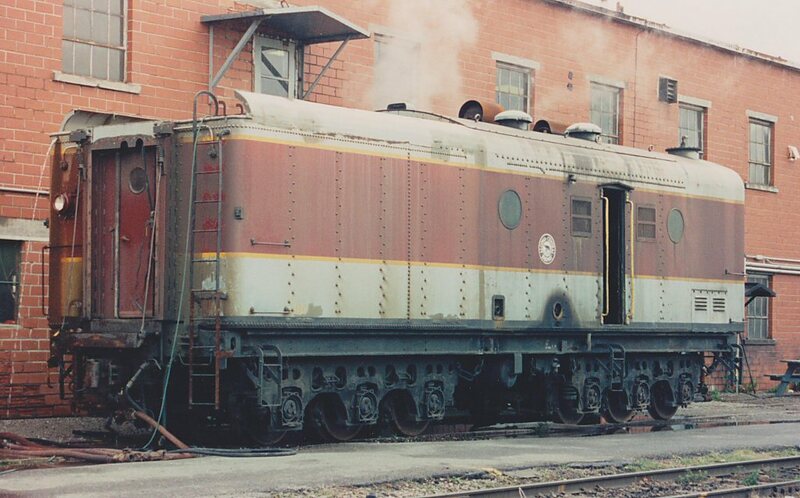 Steam generator cars and the ex-CPR lighweight coaches acquired in 1969 had the grey brought down the tops of the sides to be level with the roof lines on the heavyweight cars. 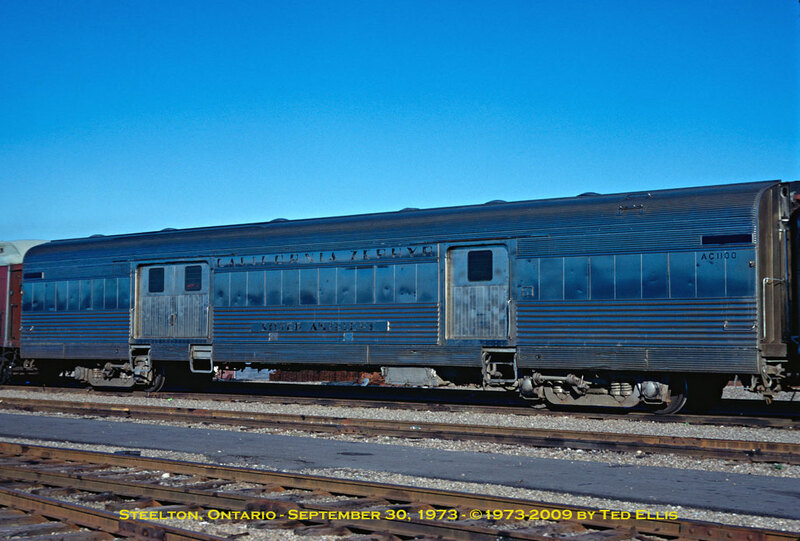 When the new lightweight cars were aquired from CPR for the expanding Agawa Canyon Tour starting in 1969, these new cars had the words Agawa Canyon Tour written on the side with stylised dashes between the words. 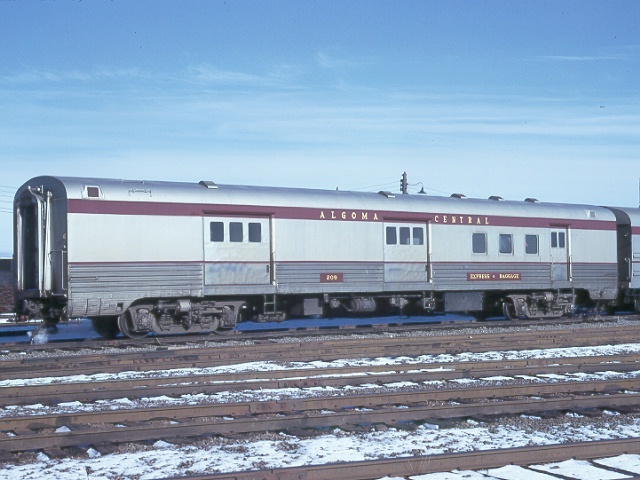 1974 (Silver Scheme) - In the early 1970's the ACR began acquiring large amounts of secondhand coaches from CP and Central of Georgia, baggage cars from DRGW, twin-unit articulated coaches from SP, and diners from UP and Santa Fe (including a couple of stainless steel cars). 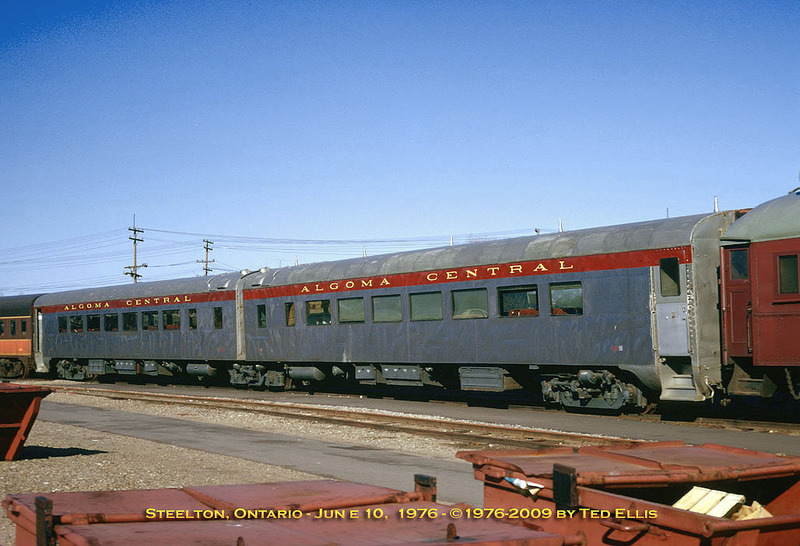 In late 1973 or 1974 the Algoma Central introduced their silver scheme, which was very similar to Canadian Pacific cars that had been painted to match the stainless steel cars of the Canadian (and certainly some of the ex-CP cars came in this colour scheme as well as the old tuscan red and the then-current silver with "Action Red" letterboards). 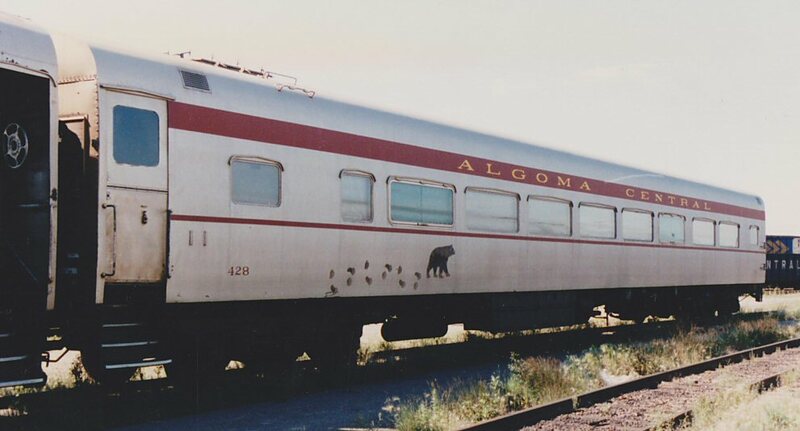 The majority of the cars painted into the AC's silver scheme with tuscan name boards and belt stripes and yellow lettering also featured a graphic of a black bear and his paw prints, reflecting the ACR's advertising slogan, "The Tracks of the Black Bear." 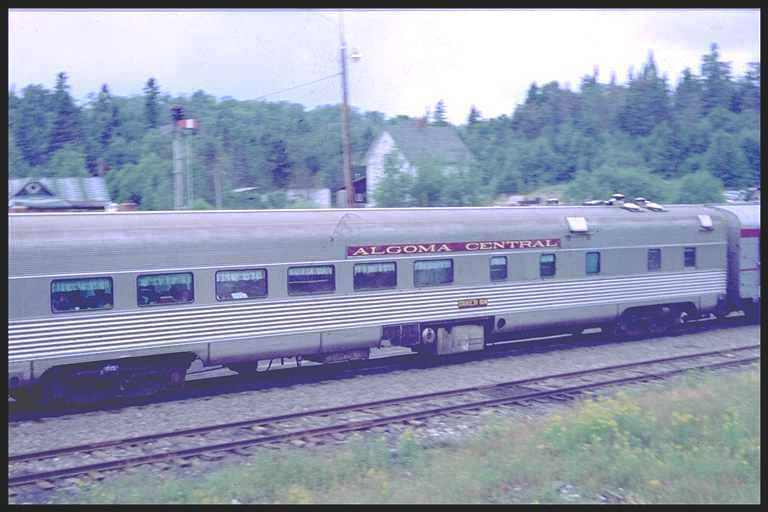 1992 (Modern Scheme) - the last change in the colour scheme for the ACR's passenger equipment, this scheme was applied to the "new" cars, originally from Canadian National, and both the cars and colour scheme are currently in use. The cars are grey, with bears at each end at the bottom, superimposed on yellow half-circles. The bears are joined by stripes of red, yellow, and dark grey. 2012 (Agawa Canyon Tour) - following the 2009 acquisition of the ex-Ski Train locomotives and coach stock to replace the equipment on the Agawa Canyon Tour train, CN undertook a program to upgrade and refurbish the "new" cars. A new paint scheme was also introduced, based on a very minor alteration of the previous Ski Train colours but replacing the DRGW gold with a handsome burgundy red colour and a new logo for the Tour Train service, which is currently being heavily promoted in advertising online.